If you’re at all interested in classic cars, you’ve probably heard about the high-dollar auctions where rare and valuable automobiles are sold. 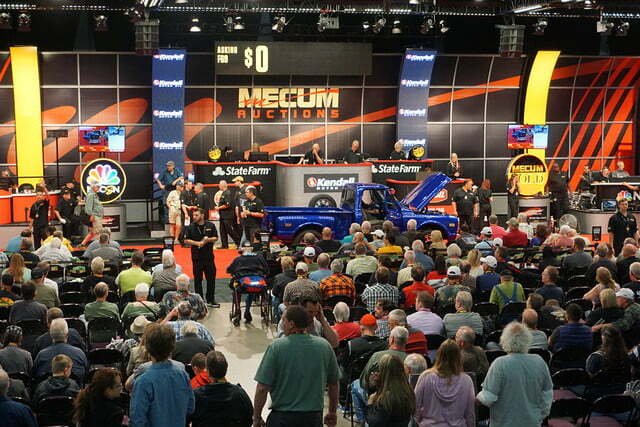 Auction houses like Barrett-Jackson, Mecum, Bonham’s, and Sotheby’s show up in places like Monterey, California in August, or Scottsdale, Arizona in January. But there are hundreds of auctions held each year across America, and if you look, there’s probably one happening near you. Auction companies facilitate the sale of thousands of cars every year, and each company has its own focus, it’s own rules, and a loyal following of buyers and sellers. The collector car market has much more in common with the stock market than it does with the regular business of buying and selling cars. Some classic cars gain value and some plummet each year, based on what’s hot and fashionable right now. Plus, auctions are now routinely televised, and that’s key to understanding the circus atmosphere. Big money demands a spectacle. 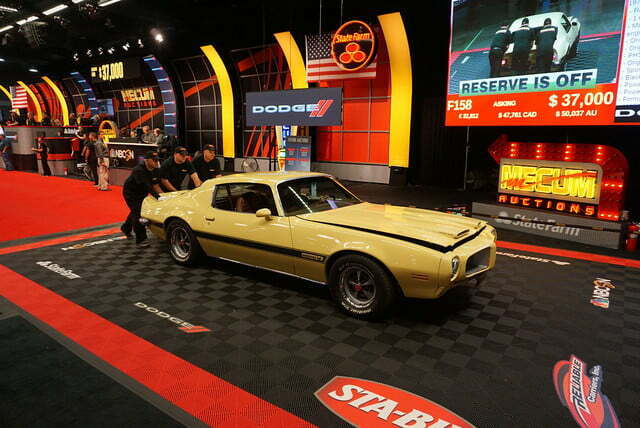 Because there’s usually tens of thousands and occasionally tens of millions of dollars involved in each sale, car collectors follow auction results very intently. Whole magazines and websites are devoted to following the market and tracking the rise and fall of prices. Full disclosure: I write for some of those magazines, analyzing individual sales and market trends. With the rapid-fire chatter of the auctioneer, the auction environment is designed to be confusing and adrenaline-charged. 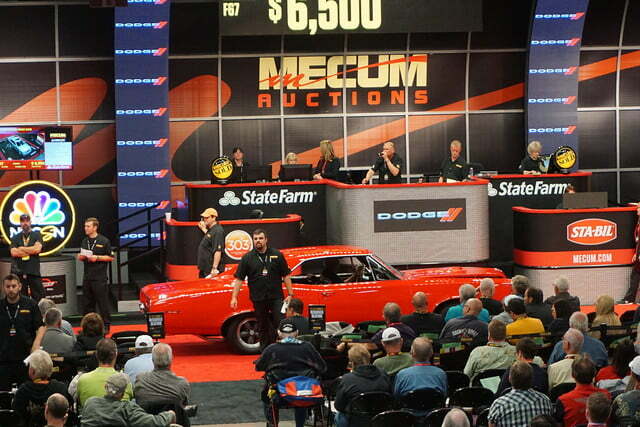 To pull back the curtain a bit, here’s how a collector car auction works. First, you’ve got people who own classic, exotic, or otherwise interesting cars, and want to sell those cars. Obviously, they want as much money as they can get for their cars, so they sell them where the buyers are ready to spend big bucks. On the other side, you’ve got the buyers. Buyers are looking to get the best possible deal, but they’re willing to pay top dollar for the right car. The key is competition. At an auction, buyers have to compete with each other in a high-stakes, fast-paced environment. There’s no tire kicking and then going home to think about it. That car will be on the block for about one minute, and then it’s gone. With the rapid-fire chatter of the auctioneer, the auction environment is designed to be confusing and adrenaline-charged. Plus, the auction house makes sure there’s a bar set up just for buyers, because a drink or two will really get things rolling. When a classic car owner wants to sell, he or she chooses an auction company and applies to consign the car. Most auction companies won’t accept just any car. Some have specialties like muscle cars, hot rods, classic European cars, and so on, and most have a minimum threshold of the price they think a car will bring before they accept it for sale. This is not the venue where you offload a 1998 Honda Civic. If the car is accepted, the buyer pays a listing fee, which can be as much as $1,000. That covers the cost of putting the car into the auction catalog, and also helps make sure that the seller is legit. I say it helps, but the auction world has seen its share of ginned-up rare cars, and although the auction houses try to catch those, sometimes they slip through. Big lawsuits can happen when someone pays tall money for a car that turns out to be a fake. One critical point about selling is the reserve. That’s the minimum price the seller is willing to accept. Some auction companies won’t sell a car with a reserve price. Barrett-Jackson is famous for that. But once the car is accepted for consignment, that’s it. The seller hands over the car, the title, and the keys, and then waits to find out how much money comes back. 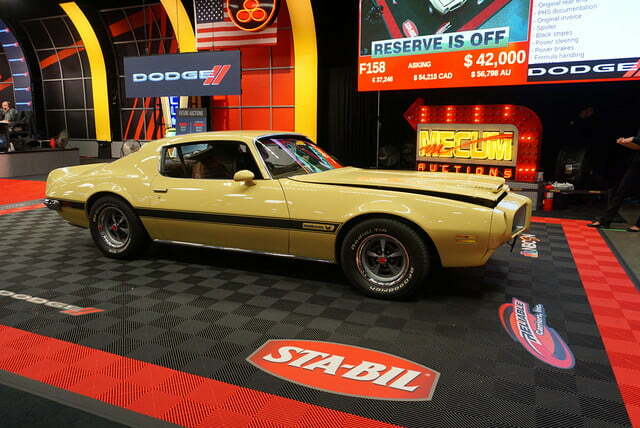 At the recent Mecum auction in Portland, Oregon, I spoke to “Larry” who was selling off his 1972 Pontiac Firebird Formula 455. This rare pony car was one of just 276 made in that year, and it was all original. This was a genuine early 70s muscle machine, and Larry was confident about the sale. As a regular seller, Larry was realistic about the ups and downs of the market. 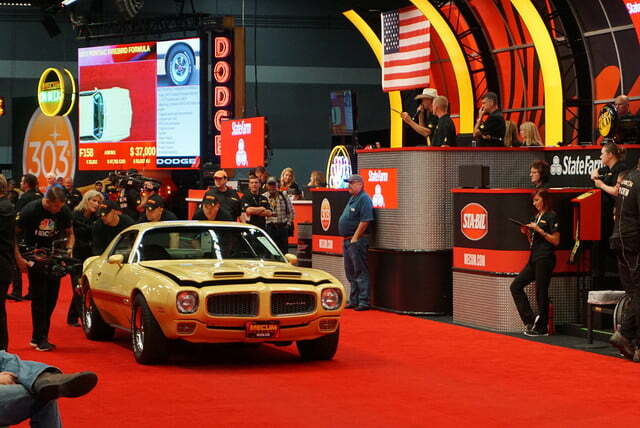 Larry’s Firebird sold for $41,000 after a lively bidding session. According to American Car Collector magazine’s 2016 price guide, top money on that car should be $41,400, so Larry did pretty well. On the buying side, there are two good reasons to look for a car at auction. The first reason is, if you want a specific car and there’s one coming up for auction, that’s where you have to go. The second is that you can get some screaming good deals at an auction. At the Mecum auction in Portland, I watched a 2005 BMW 645i coupe sell for just $9,250. Kelley Blue Book estimates that car’s value at something over $11,000 on a private party sale, and over $14,000 at a dealer. That leads to a good point, because it’s generally up to the buyer to be prepared and know what they’re bidding on. If you don’t know the book value of a car, you’ve got no business buying that car at an auction. Sports Car Market and American Car Collector magazines publish a pocket price guide to collectible cars for just this reason. Smart buyers will have looked the cars over thoroughly and done some research before bidding. Every auction house publishes a catalog online before the auction. So if you’re looking for a 1967 Mustang, you can find the auction that has one, research recent sale prices, find out where to look for obvious problems, and get a sense of how much you’re willing to spend. Then when you get to the auction, you can take a good look at the car before it hits the block and see if it meets your expectations. If you don’t do your homework, you could end up sorry. I spoke to one bidder who bought a car on impulse. “Bill” had spent $9,000 on a 1999 Corvette, and was looking it over in the post-sale parking lot. The other thing to remember as a buyer is that the price you bid is not the price you’re going to pay. Most auction houses add a “buyer’s premium” of 10 percent (or more) on top of the winning bid. That money goes straight to the auctioneer. So Bill’s winning bid of $9,000 was really more like $9,900. Yet even so, Kelley Blue Book rates that car at over $10,000 for a private party sale, so Bill shouldn’t feel too bad. 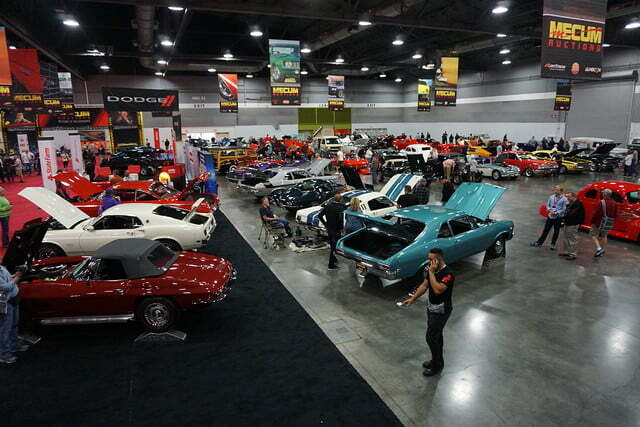 Whether you’re buying or selling or just there to watch and daydream, a collector auction is a car show unlike anything else you can see. From hot rods to perfectly mundane cars, there’s no limit to what you might see at an auction. The environment is definitely not for every buyer, but if you’re into cars, you should go to at least one auction just to have the experience. But be warned, the temptation to pick up a bidder’s card might be extremely hard to resist.